The fifth largest city in Spain, Zaragoza is the capital of the Aragon region, roughly halfway between Madrid and Barcelona in the north-east of Spain. Zaragoza differs from the other major Spanish cities such as Madrid, Barcelona, Valencia and Seville in that it is not an obvious tourist destination. Although it is an industrial city there are some sights worth seeing and below we give you a guide to the best attractions and sights of Zaragoza if you happen to be visiting there. We have an index of webcams (web cams) which are digital cameras beaming live streaming footage of Zaragoza cams. These pictures and images of Zaragoza are being transmitted 24 hours a day and can be seen from any computer or mobile device anywhere in the world. Zaragoza (Zaragosa) was founded by the Romans over 2,000 years ago, indeed the cities name derives from the Emperor Caesar Augusta. In the 11th century Zaragoza was ruled by the Beni-Hud dynasty of which the legendary El Cid was a mercenary leader. So what are the best attractions to see when in Zaragoza? Head first of all to the Plaza del Pilar and explore from there. The famous Spanish painter Goya was born in a small village close by in 1746. You can see some of his paintings in the baroque church of Basilica de Nuestra Senora del Pilar. You can’t fail to notice the huge domed church surrounded by 10 smaller domes, with four tall towers in each corner. La Lonja is the Renaissance exchange constructed from thousands of small bricks. La Seo cathedral is a gothic cathedral with many treasures on display in the museum including paintings, tapestries and sculptures. 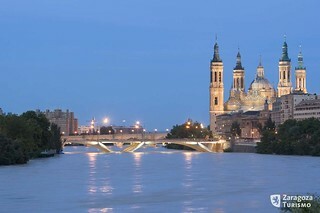 The river Ebro flows through Zaragoza and there are a number of impressive bridges into the city. Puente de Piedra is the most-photographed. Built in 1813 this bridge has elements of Basque, French and Italian architecture. Other monuments include the 18th century Puerta del Carmen, the 13th century Arab Baths and the 11th century Moorish Palacio de la Aljaferia with it’s lavish carved ceilings. The Zaragoza webcams below range the major tourist sites of Zaragoza. Please help us by suggesting any other Zaragoza webcams that you know of so we can add to our list of webcams. As well as our webcams showing pictures and images of Zaragoza we also have an good video below showing the most important sights and tourist attractions of Zaragoza at nightime – including the Basilica de Nuestra Señora del Pilar. Page Summary – This page contains links to webcams situated in Spain’s fifth largest city. We also have videos and images so you can see what Zaragoza looks like.